Russia said Saturday that it had stepped up airstrikes against Islamic State extremists in Syria, in support of Syrian troops who have seized two villages north of Hama since late Friday. Russian Defense Ministry spokesman Igor Konashenkov, speaking to Russian reporters, linked the rising number of strikes to "significant growth in the number of ground targets" detected through aerial and satellite reconnaissance. In Washington, top U.S. defense officials held a secure video conference with their Russian counterparts, as part of a push to promote safe flight operations in increasingly crowded Syrian airspace. Pentagon spokesman Peter Cook described the talks as "professional" and said they focused narrowly on air safety procedures. The Russian Defense Ministry used similar language to describe the talks. U.S. officials were highly critical of Russia, after Moscow gave vague warnings on September 30 about an hour before launching its first airstrikes inside Syria in support of embattled President Bashar al-Assad. Moscow claims the airstrikes are targeting mainly Islamic State militants, but rebel groups say most of the strikes are hitting areas where the extremist group is not present. 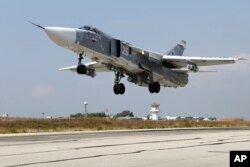 Russia said its planes had flown 64 sorties and targeted 54 sites since Friday. Among the sites attacked, it said, were command outposts in Aleppo and Idlib provinces. The U.S.-led coalition said it targeted Islamic State in Syria with five airstrikes on Friday, and also hit the militant group with 20 bombardments in Iraq, according to a statement released Saturday. The Combined Joint Task Force said the Syria strikes hit tactical units near Al Hasakah, Ar Raqqah, Manbij and Mar'a and also destroyed tactical vehicles and a building belonging to Islamic State in those areas. Near Palmyra, a strike destroyed or damaged Islamic State front-end loaders, tractorlike equipment that is used in construction, it said. Four attacks concentrated near Ramadi in Iraq struck two Islamic State tactical units, and also destroyed a preparation area, a front-end loader, a heavy machine gun and six fighting positions. They also "denied ISIL access to terrain," the statement said, using a common acronym for Islamic State. The area near Sultan Abdallah also had heavy bombardment, with three strikes destroying a vehicle-bomb factory and storage facility. Coalition nations conducting strikes in Iraq include the United States, Australia, Canada, France, Jordan, the Netherlands and the United Kingdom. Coalition nations conducting strikes in Syria include the United States, Australia, Bahrain, Canada, France, Jordan, Saudi Arabia, Turkey and the United Arab Emirates.